The upgrade from cookies to web-storage discussed below has now been implemented. However, while the latest versions of most popular browser all seem to support web-storage, the original cookie method will hopefully still work on older browser. The problem that prompted the upgrade was linked to the continued growth in the size of the website itself, such that the number of pages caused the 4-8kbyte cookie limited imposed by the host and many browsers to be exceeded. Any feedback on any observed problems would be welcomed. 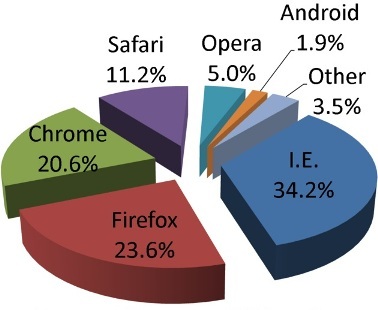 The 5 browsers listed above account for 94.6% of the browser market, as per 2011, which is well above the 80/20 rule related to effort on return. However, before getting into the details associated with HTML5 web storage, it might be worth explaining what original functionality this feature might replace in the future. Originally, when this website was first developed, the tree and sitemap menus had no 'memory', so that when you switched to a new page, the open status of these menus was reset to its default state. So having taken the trouble to open up the tree structure to find a specific topic, it was more than a little irritating for the tree structure to then immediately collapse back to its default state, when switching to the topic just found. So what mechanisms, if any, were available to address this requirement? In essence, the 'web' is based on requests and responses formatted into the HTTP protocol, which is a stateless protocol that does not require the server to retain any information or status about the client-user between successive requests. However, within the overall development of the web, the idea of a 'cookie' was proposed, as early as 1994, so that a website could send user-specific data to the client-side browser and for that browser to then return updated information back to the website server. This data could then be used for any number of applications, e.g. Where did this ignorance lead? Unfortunately, a problem appeared quite recently as the size of each website was expanded in terms of the number of pages. Originally, it was not realised that cookies are encoded into the HTTP protocol and then passed between web server and client-side browser. As outlined, this website created 4 cookies, as listed above, which then had to be transported within the HTTP protocol, which it turns out that most servers check for some overall size limit. The exact size depends on the company that is providing the web hosting service for your website, but will typically be between 4-8Kbytes. Clearly, the growth in the sizes of the website was bound to cause a problem sooner or later, as the size of the cookies reflected this growth. But surely, the problem was detected before deploying to the live website? Actually, it was not detected in testing, because being a client-side design, the websites can be run locally on any PC without a server. In this environment the checks on the total size of the HTTP request packages are either not performed or have some higher maximum than my actual web host server. So it came as a bit of a surprise, after uploading the websites to the server to discover a serious run-time error occurring, which manifested itself as a somewhat non-descript server error. However, after an exchange of problems reports with my web host provider, it seemed that my cookie mechanism was exceeding the HTTP packet size imposed by the server and that some other solution would be required. Before outlining the issues surrounding a potential implementation based on the HTML5 web storage approach, it is worth outlining the basic solution taken regarding the immediate and urgent problem with the cookie mechanism. The solution adopted was quite simple once it was realised that the server error was caused by the total length of the 4 cookie 'files' in the HTTP protocol. Given that reducing the size of a specific cookie was quite problematic, it was recognised that the tree and sitemap menus produced cookies of the same format, although originally each menu could save its own independent open status. The short-term solution therefore adopted is for the tree and sitemap menus to share the same cookie, which means that opening either the tree or sitemap menus to a given level is then reflected in the other menu, when the next page is loaded. Personally, on reflection, this approach seems to have several advantages and comes with the clear benefit that it avoids the 'here-and-now' server problem as well as supporting the continued expansion of the websites for the immediate future. As such, it has bought time to consider and reflect on the implications of deploying a long-terms solution based on 'HTML5 web storage'. The idea of web storage, as defined by HTML5, comes in two favours known as 'sessionStorage' and 'localStorage'. From a programming perspective, each method is essentially identical in form, except for the change in syntax; however, operationally sessionStorage is automatically deleted on exiting the browser, while localStorage is retained. So which is preferred as a replacement for the current cookie application? The amount of data that can be saved is dramatically increased. As previous implied, when a website is accessed on a web server by a client-side browser, cookies are not saved locally, but rather transmitted back and forth between the server and the client. This leads to problems, because the server invariably put a limit on the size of a HTTP request, which in-turn puts an equally finite limit on the size of the cookies, even though the server makes no use of the cookie data in this specific application. In this respect, sessionStoarge is almost purpose built for this type of application in that its allows relatively large amounts of data, e.g. 10Mbytes as opposed to 4Kbytes, to be stored locally on the client-side system, which circumvents any size restrictions imposed by the server and, in addition, removes the unnecessary overhead of transmitting the data between the server and client and back again. So can sessionStorage be used to immediately replace cookies in this case? A version of this website has already been developed that completely replaces the need for any cookies through the application of sessionStorage, which has all the benefits previously outlined. This approach has also be successfully tested against the latest versions of all 5 browsers supported, but has not yet been deployed. Basically, we need to return to the issues associated with 'browser variance' and 'backward compatibility' as highlighted at the start of this discussion. We might begin to examine these issues using the following HTML file as a test example, designed to highlight a number of variances in operation, when run under different browsers. As such, this code can be cut and pasted into any <file.html> on your own 'local' system and tested against any number of browsers. Note: when running on your 'local' system, the HTML file is simply opened by a browser without the file being associated with any web host. For example, if the file is run under a local host, such as Microsofts Internet Information Service (IIS), the results will be different to that described below. The <try/catch> blocks in both functions allows the code to be tested for an error, which if it occurs causes the exception to be trapped by the <catch(err)> block. Within each <try> block, the first statement tests to see if sessionStorage has been defined in the local browser and, if not, an appropriate message is displayed via the alert() statement before the code simply returns to the caller. Clearly, if this first statement causes an error, the path is different, as control is passed to the <catch> block, which displays the exception message before returning to the caller. Finally, if no exception occurs and sessionStorage is defined, the message displayed should be 'set/get data'. As such, we have a bit of code that can test for variance in the browser operation in a local system. Note: It will be stated up-front that the example code above works, as expected, in all 5 browsers tested when run on a web server or local host, such as IIS. However, this desirable consistency is not reflected when run locally and also raises concerns as to the exact operation when run using older versions of these browsers, before they supported HTML5 webs storage. As the note above implies, the resulting local operation is not consistent when compared against the 5 selected browsers. The table below shows the variance in browser operation, for both sessionStorage and localStorage modes, when run as a local system. Based on the table above, the latest version of Chrome, Safari and Opera all supported both the session and local modes of web storage, although Opera can have problems with the file-directory specification on local systems. Apparently, Microsofts IE9 only supports web storage when run on a host and the test code shows that the storage, i.e. session or local, is undefined, when run in a local system. The operation of Firefox seems more inexplicable in that localStorage works locally, while sessionStorage actually causes an exception. Why worry about local operation as long as it works on a hosted server? For many people, this may be a non-issue, but it is very convenient to be able to test and operate a client-side website in a local system without the hassle of supporting a local host, such as IIS. As far as this website is concerned, this was the case prior to introduction of HTML5 web storage, with the one exception of Chrome's support of local cookies. Of course, Google might argue that cookie operation is implicitly linked to a web server, even though all its competitors support local cookie operation. However, web storage seems to be implicitly linked to client-side data storage applications and, in this sense, independent of the web host, such that one might question why Microsoft has taken its approach. But how does this affect the decision to replace cookies with web storage? Examination of the <if/then/else> permutations in the code above, in conjunction with the results in the table, suggests that simply replacing cookies with sessionStorage will be messy, if local operation is to be supported. However, even if we ignore the requirement for local web operation, there is sufficient concern raised by the example code and table above, when extended to older versions of all these browser in which web storage is not supported. Again, it is unclear as to the total scope of 'undefined' and 'error exception' coding that might be required, which will then be compounded by the complexity of having to simultaneously support the original cookie mechanisms, when web storage is not available in older browsers. So does this mean the web storage will never be supported by this website? No, based on the 80/20 rule, there will come a time when +80% of users will use browsers that support web storage, such that the cookie mechanism will simply be turned off and the feature of saved tree status will simply not be available on older browsers. As far as local system operation is concerned, there are browsers that seem to have no problems, or technical objections, in fully supporting this mode of operation. Of course, there is also the hope that all browsers might converge to a consistent approach to local operation, as there appears to be no obvious technical reason for the different approaches, other than some vendors refusing to correct any initial approach taken in the implementation of a given 'feature'. The nice thing about standards is that there are so many to choose from! This terms relates to the ability of a website, web application, HTML construct or client-side script to be supported by all web browsers. As such, this capability allows a website or web application to be properly rendered by all browsers. The term "cookie" can be traced back to computer programmer Lou Montulli, who developed the idea back in 1994. Initially, the idea was not widely known to the public because they were accepted by default without any notification. However, the public would eventually learn about cookies after the Financial Times published an article about them on February 12, 1996. Subsequently, cookies received a lot of media attention, especially in terms of the potential privacy implications.